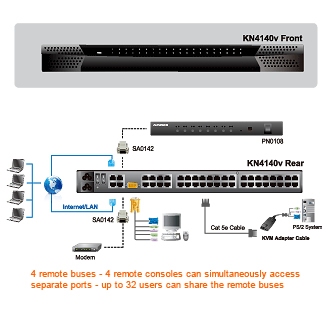 The Aten KN4140v is a 40 Port 5-User (1-Local, 4-Remote) CAT5 IP KVM switch w/ Virtual Media. This KVM over the NET switch allows local and remote operators to monitor and access the entire enterprise data center over the Internet using a web-based browser. In addition, it offers out-of-band access - including external modem support - for BIOS-level troubleshooting when the network is down. This switch has been designed with unique and powerful features for that enable administrators to manage their entire server room and data center devices easily and conveniently from just about anywhere in the world. A special Message Board feature - which like an internet chat program - lets any number of remotely logged in users exchange information and communicate with each other or to cooperatively manage the installation. A Panel Array Mode- allows real-time monitoring of up to 40 servers at once. Other features that contribute to the switches' powerful capabilities include: Mouse DynaSync, Adapter ID, and Virtual Media support. The Virtual Media function lets you map USB storage media (including DVD/CD drives), and image files to a remote server - allowing administrators to conduct file transfers, install applications and OS patches, and perform diagnostics remotely with ease. With it's dual on-board NICs and dual power supplies, this switch has been built for 24/7 reliability to ensure the highest rate of availability for your server room and data center services .The switch design also features Green IT solutions that include four temperature sensors to regulate up to six fans - making sure they are always running at optimum speed - throttling down and speeding up depending on the room temperature, reducing data center IT operation costs through a more efficient use of energy. Now, using Altusen KVM Over the NET switches, IT administrators can manage their server rooms and data centers from practically anywhere - minimizing travel costs and MTTR (Mean Time to Repair) - and ensuring the highest availability of data center services possible. For best results we recommend that the computers used to access the switch have at least a P III 1 GHz processor, with their screen resolution set to 1024 x 768. 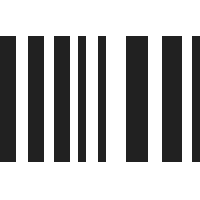 Browsers must support 128-bit SSL encryption. For best results, a network transfer speed of at least 512kbps is recommended. For the browser-based Java Applet and Java Client AP, the latest version of Sun's Java Runtime Environment (JRE) must be installed.